It’s always a great evening when the Celtics get smashed. The worst defeat the Knicks suffered this season was an embarrassing 41-point defeat to Boston at home, so it was highly appropriate that New York returned the favor with this rout. MELO SETS THE TONE: The Knicks came out the gate with Carmelo Anthony dropping 2 assists via backdoor cuts from Iman Shumpert. The team quickly followed the ball movement lead to a 12-0 run that had New York up 18-5. JR Smith added two triples and when the first quarter ended, the Knicks had 9 assists on 62% shooting for a 31-15 cushion. The sparks for this great start were Melo (11 points, 2 assists, 2 steals), Tyson Chandler (5 rebounds) and Kenyon Martin (4 points, 1 block). BENCH FIREPOWER: There was no dropoff when the second unit came in to start the second quarter. In fact, the Knicks bench blew the game open. Lead by Jeremy Tyler delivering his best game of the season (17 points, 5 rebounds, 2 blocks), New York had 63 points from the reserves, allowing Melo and company to get extended rest in the second and all of the fourth quarter. JR chipped in 17, and Tim Hardaway Jr. added his dribble penetration and deadly 3-point shooting for 16 points. CHANDLER ON THE RISE: It was a struggle his first few games back, but Chandler is starting to get back into a groove on offense and defense (12 points, 13 rebounds). He was the recipient of several nasty alley-oops, and when Tyson gets those touches his defensive intensity picks up. AUDITION FOR RONDO? : In the off-season, stories began circulating that Melo was pushing for the Knicks to sign Rondo. A few months back, Rondo’s high school coach said Melo was actively trying to recruit him. Rondo is just six games back into his comeback from ACL surgery, so he doesn’t have his legs and looked pretty bad out there (7 points, 5 assists, 4 turnovers). 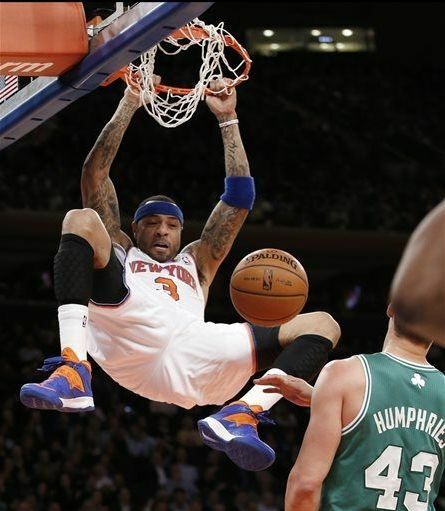 However, if Rondo can get back to his old form, he’d be a huge asset for Melo’s game. All ACL injuries aren’t created the same, so I’m sure the Knicks will be monitoring his progress closely to see if he bounces back like Shumpert, or slides further like we’ve seen with Derrick Rose. I’m banking on the former happening. THREE AND NO REASON TO STOP: The Knicks are on a three game winning streak and have the Cleveland Cavaliers next on Thursday (January 30). The Cavs are struggling having lost four of their last five, so the Knicks should keep this streak going. SOUR NOTES: Shumpert left the game early with a right shoulder strain, a re-aggravation of an injury he suffered in the pre-season. K-Mart was also forced to sit after re-aggravating his left ankle sprain. Metta World Peace returned, so we’ll just have to pray he can step up with spot minutes if K-Mart misses any extended time.